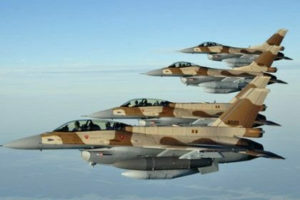 The United States has approved the sale to Morocco of twenty-five new F-16C/D Block 72 aircraft and related equipment for an estimated cost of $3.7 billion, the Defense Security Cooperation Agency said in a statement. The Agency said the North African country also proposed to buy equipment to upgrade its existing 23 F-16 fighter jets to F‑16V configuration. The contract that Lockheed Corporation will carry out, will cost an estimate of $985.2 million. In addition to the 25 new jets, the larger package includes 29 Pratt & Whitney F100-229 engines; 26 APG-83 active electronically scanned array radars; 26 modular mission computers; 26 Link 16 systems; 40 Joint Helmet Mounted Cueing Systems; 30 M61 Al Vulcan 20mm guns; 40 AIM-120C-7 Advanced Medium Range Air-to-Air Missiles; 50 GBU-49 bombs; 60 GBU-39/B Small Diameter Bombs; and assorted other equipment. The upgrade package includes much of the same equipment, with similar quantities of AESA radars, Link 16 systems and weapons. The configuration improves the radars and avionics on the older jets. According to the Defense Security Cooperation Agency, these deals will reinforce Morocco’s self-defense capabilities and improve interoperability with the United States and other regional allies. The military sale will also enhance Morocco’s ability to undertake coalition operations, as it has done in the past in flying sorties against ISIS in Syria and Iraq, says the US DECA. Morocco is a key customer of US military know-how. The North African country over 2014-2018 featured among the 25 global leading arm importers, and the second on the African continent. Posted by Hafid El Fassy on March 26, 2019. Filed under Business, News, Zoom. You can follow any responses to this entry through the RSS 2.0. Both comments and pings are currently closed.